Several of the top-tier contenders have announced their first-quarter fundraising totals for the period ending March 31. Bernie Sanders paced the field with $18.2 million, followed by California Sen. Kamala Harris at $12 million and former Texas Rep. Beto O'Rourke at $9.4 million. Pete Buttigieg, the mayor of South Bend, Ind., surprised many Democrats by pulling in $7 million, despite being a relative unknown at the start of his campaign. 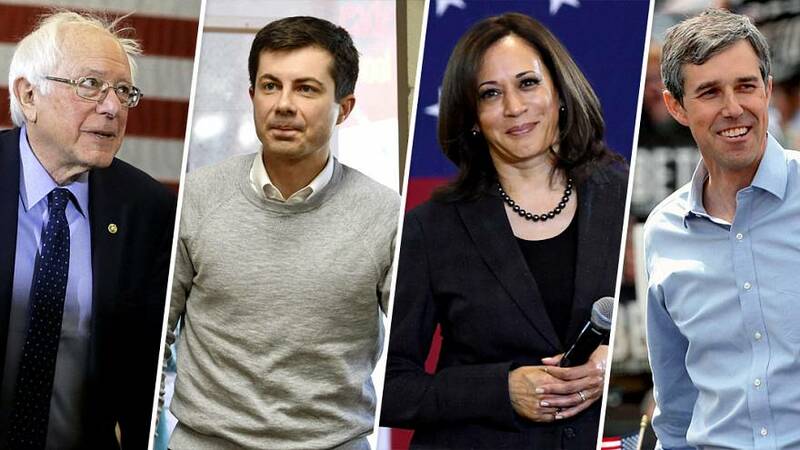 "In a field with north of 10 candidates that were actually fundraising, Bernie's number is nothing short of extraordinary," said Robert Wolf, a key early backer of Obama's first campaign who has cut checks to O'Rourke, Harris, Buttigieg, New York Sen. Kirsten Gillibrand and New Jersey Sen. Cory Booker already this year. "We have a lot of friends running," Wolf said in a telephone interview with NBC News. "There's a lot of new and exciting candidates running and we want them to get to the debate stage." Vice President Joe Biden, who is leading in national polls of Democrats, has not yet entered the race. Neither he nor Wolf have endorsed a candidate in the race, and many top Democratic donors are either holding back or have been shunned by candidates trying to prove they aren't beholden to the rich and powerful. All of the leading Democratic candidates have pledged not to take money from corporate political action committees — which actually represent a tiny slice of giving in presidential campaigns — and many have made vows not take checks from lobbyists, fossil fuel industry employees or other sources. "What's really important is the power of the small dollar donor in this process," Zimmerman said. "When the first barista in Williamsburg is chosen for an ambassadorship, then I'll know the revolution is complete." "Harris has the ability to raise low-dollar funds and major-donor funds," said Patti Solis Doyle, who served as the campaign manager for Clinton in 2008. "She seems to have tapped into a lot of the old Hillary donors. So I think it's important to do both. But she strikes me as one of the few candidates who has the ability to raise money from major donors and low-dollar donors, and that's an asset." Interestingly, his campaign reported having the same number of contributions — 218,000 — as Harris' had donors. President Donald Trump, who has not yet reported his first-quarter totals for 2019, raised $67.5 millionfor his re-election campaign last year, a figure that does not include money collected by outside groups dedicated to assisting his campaign. Most of the Democratic field has yet to announce first-quarter fundraising numbers, including Booker, Gillibrand, Sens. Elizabeth Warren and Amy Klobuchar of Massachusetts and Minnesota, respectively and former HUD Secretary Julian Castro.